It’s easy to make authentic Tandoori Paneer Tikka Kebabs at home. Get the recipe below, first posted on the blog in 2012. Jon and I have now been together for 12 and a half years and as long as I have known him he’s been a vegetarian. When we met aged just 13 I didn’t have an adventurous palate. Dinner in my house was very much meat and two veg so when I went to eat round Jon’s it was all the more exciting. I hadn’t tried vegetable curries and ingredients such as aubergines, okra, chick peas and lentils were all new to me! It seems mad now given that Jon and I LOVE Indian food and eat it all the time. In fact we’ve even joked that when we get married our wedding breakfast will be contemporary Indian cuisine! Over the years I’ve experimented more and more with vegetarian cooking. In fact many of the recipes on the blog are vegetarian as almost all of my meals are now meat free. I doubt I’ll ever give up meat (or fish) completely but for now I’m happy saving them for special occasions. If you want to see more vegetarian recipes check out the index here. If it wasn’t for Jon I don’t think I would ever have stumbled across one of my favourite Indian ingredients – paneer. For those of you who aren’t familliar with it, paneer is an unaged, acid-set, non-melting curd cheese. It is quite simple to make just by heating milk, then curdling it with lemon juice, vinegar or citric acid.You may also have seen it on menus as chhena or chhana. It is sometimes left in a creamy cottage cheese type state but I love it as a hard squeaky cheese which can be cut in to cubes. If you’ve not tried paneer before, check out the vegetarian section of your local Indian takeaway’s menu. I guarantee you’ll find it on there! Tikka (or teeka) is a marinade made from a mixture of aromatic spices and yogurt. It’s often associated with chicken tikka masalla where the marinade tenderises the cubes of chicken but it also works really well on paneer. There’s no need to leave the marinade on for hours like you would with meat. 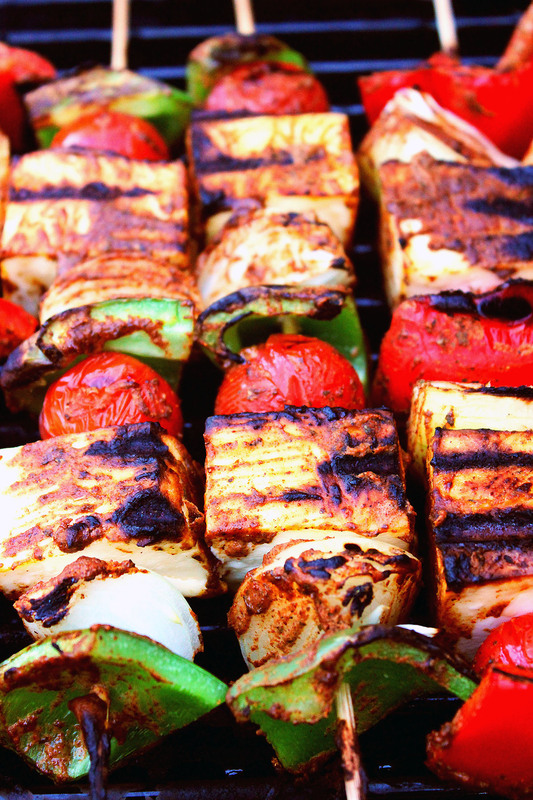 Instead simply brush the kebabs with the marinade before placing on the grill and top up as required! Ok, so I don’t ACTUALLY own a tandoor, and when I’ve made these kebabs in the past I’ve cooked them under a hot grill or on a griddle pan. But, since receiving the Char Broil Big Easy Smoker, Roaster and Grill I’ve realised that it works in a very similar way to a traditional tandoor. The term tandoor refers to a variety of ovens, usually cylindrical in shape and made of clay or metal. Tandoors are traditionally heated by a charcoal or wood fire which adds a smokey flavour – this can be achieved by adding wood chips to the Big Easy’s smoking box. The most important thing about a tandoor however is that it gets REALLY hot with temperatures reaching as high as 480 °C / 900 °F. Turn the Big Easy up high and let the internal temperature soar before cooking! Who knew the Big Easy was such a clever bit of kit! Cooking the kebabs on the grill plate worked so well I will be trying naan bread, samosas and maybe even Balochi aloo (potatoes stuffed with paneer, vegetables and cashew nuts before being roasted in the tandoor). If you don’t have a Big Easy then why not griddle these on high for 5 mins on each side. You want the cheese and vegetables nicely charred before turning them over. They can also be cooked under the grill. Before beginning the prep, soak the bamboo skewers in warm water. Cut the paneer and vegetables into large chunks (roughly 1.5 - 2 inches wide). 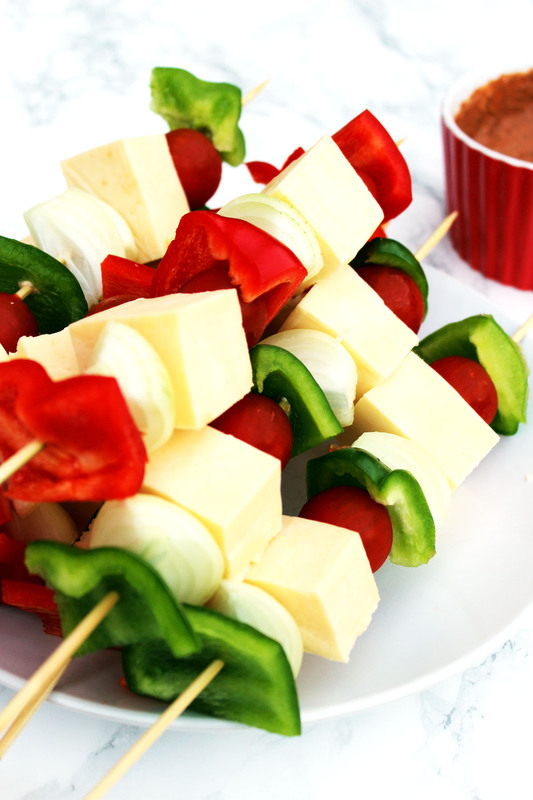 Thread the paneer and vegetables on to the bamboo skewers. In a small bowl mix yorgurt with the lemon juice, ginger, garlic, salt and spices, to form a marinade. 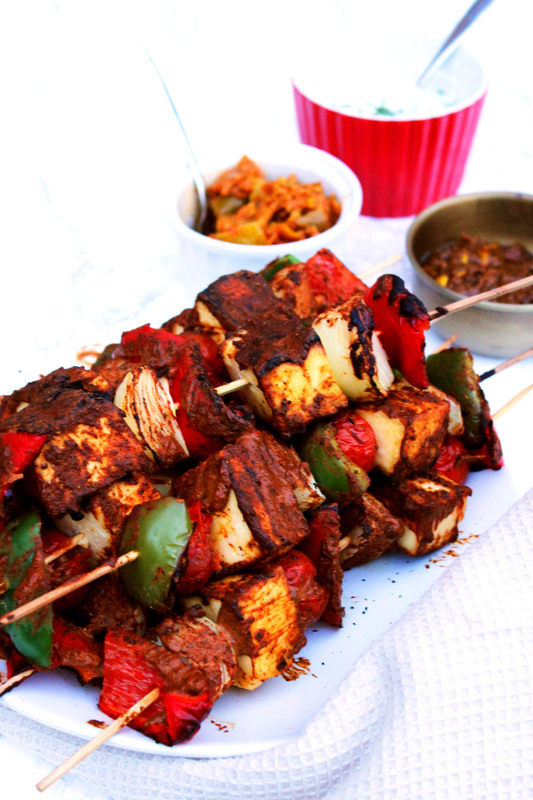 Brush the paneer and vegetables with the marinade. Let the marinaded paneer and vegetables rest while the Big Easy is pre-heated on a high heat. Once the Big Easy is blisteringly hot, place the kebabs on to the grilling rack. Close the lid and let cook for 5-10minutes or until the paneer and vegetables are charred. Turn the kebabs over and cook for a further 5-10minutes. Serve with raita, chutney, and pickles. I love this, bookmarking it immediately! I was looking at paneer the other day, about to buy it, but lacking inspiration. Fabulous! Yum! I’ve never thought to add paneer to kebabs. The flavors sound incredible. I love all the flavors this dish seems to be bursting with! And those pictures with the perfect char on the kebobs! Lovely! Thanks for sharing. Tikka is one of my favorite things when we eat at our local Indian place…. this is definitely going to make an appearance on our table at home! :). I loved grilled paneer, crusty on the outside but still soft in the middle with a bit of smoke! Just LOOK at all that delicious colour!! I love paneer – it’s my favourite cheese ever. Can’t wait to give this recipe a try. Those look gorgeous. Always pleased to find meatless barbecue options! Yum. Yes! It’s so tricky catering for veggies come barbecue season. My OH is very happy we now have these in our repertoire!